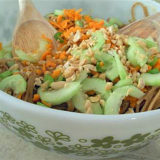 Whole wheat spaghetti dances in an easy peanut butter dressing along with delicious veggies and chopped peanuts. My friend Laurie, a devoted mother of two and generally cool chick, shared this recipe with me. She swears it’s kid-friendly, and I trust her judgment because this is a gal who very impressively made most of her baby food from scratch, and aside from that time she tried to sneak me disgusting sweet potato puree disguised as hot chocolate during her Deceptively Delicious phase, she’s never steered me wrong. It’s also pretty adult-friendly – aka, YUMMY. Doesn’t it look yummy? And don’t you love my awesome vintage Pyrex bowl?! I love the green flowers. Of course. But back to Peanut Butter Noodles: They’re incredibly easy to make, and I’m psyched because there was plenty left over for a couple easy take-to-work lunches. Oh, and speaking of lunches, Laurie says the big draw for her was that you serve it room temperature, so it’ll be great for her kids’ lunches. Boil the pasta according to the package directions. 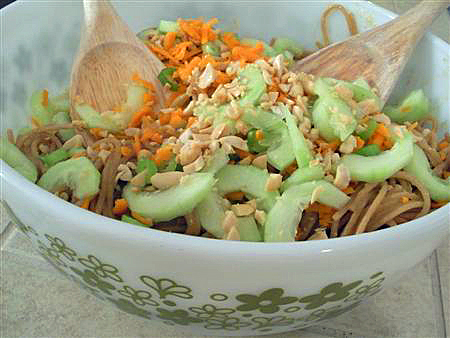 While it's cooking, blend together everything but the noodles and the nuts in a large bowl. Drain and rinse the pasta, then pour the pasta in to the large bowl with the peanut butter mixture, and mix well. 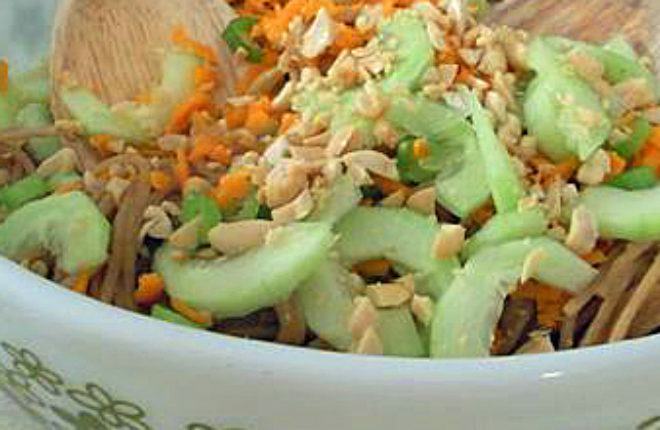 Top with chopped peanuts and any optional toppings (I don't think I'd ever make this without the additional scallions and cuke – yum!) Best enjoyed at room temperature, though you can do it cold, too. Thanks, Laurie! For this, I think I can finally let go of the Sweet Potato Disaster. Yum! These noodles look so good (and you’re right…the bowl is very cute). We’re going to try them tonight with Wonton soup on the side (Steve is craving Wonton soup). And I was LOL on Laurie’s sweet potato hot chocolate maneuver. I deceived the boys several times with sweet potato pancakes and chicken nuggets. However, I was never brave enough to sneak it in to the desserts. Yikes! That’s awesome, glad you tried them! Now I’m very curious about this wonton soup of which you speak. Sounds good! Cucumber also used to not only our food but also can be very beneficial for our skin, especially for dry skin.